Walking around Santorini in the winter always makes me think and eventually realize what is it about this place I love so much. This time I thought I'd share it with you. 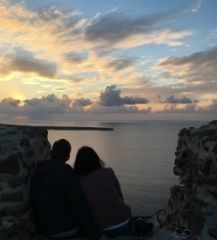 Here are six reasons that make me love Santorini. I initially came here for three months..Three years later, I am still here. I guess this is why. The first one is quite obvious since you all know how beautiful Santorini is. I generally have a thing about islands. I just love the sea. But, the natural beauty of this particular island is unreal. Those of you who have seen it in person know what I am talking about. You come here for a couple of days and enjoy the views. But for us living here, it is all a bit different. It is more than just blue domes and white washed buildings. It is the serenity of the landscape and the tranquility that it offers you. You step outside your door, you take a deep breath and look around. And at that very moment, nothing else matters. All problems fade away. Even on your worst days, Santorini will somehow manage to put a smile on your face. And that is exactly why I love it. There is such a variety of scenery and things to do in Santorini. You want a quiet place to be by yourself or a place full of people? Are you are looking to meet people? Fancy meal or just some gyros to go? Beach or cliff-side? You get the point.. Choose anything you want based on your mood and you will find it in Santorini. Then there is also the contrast between winter and summer. Santorini feels like two different islands. I would describe winter as the calm before the storm. But eventually it is so quiet it gets a bit boring. And then - just in time- summer starts and it is madness again! What I am trying to say is that you never get bored in Santorini. It is always interesting and has something new to offer you. Two seasons, very very different, but very interesting in their own way. 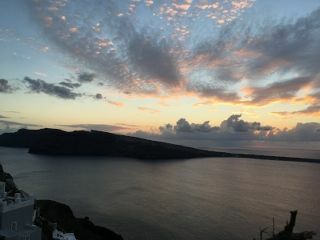 Living in such a beautiful place makes my friends want to come visit more often and I am glad to say I get to see more of them nowadays and share great times with them in Santorini. I love Santorini because it has given me the chance to meet amazing people I would never have met otherwise. Being here is like travelling around the world without even leaving the island. People come here from every corner of the earth and they all have something interesting to share, something new for me to learn. Santorini made that possible and I am grateful. I 've made amazing friends here. That includes you John and Elisa, Claudio and Luisa and of course my soulmate Jackson. By the way, Jackson you really need to come back this summer and climb more rooftops with me-I will start a petition! Reason #6: Because... of the sunsets. What else? Last reason I love Santorini is because this happens everyday. And it is just so beautiful. Yes, I am talking about the sunset. Tell me, why do you love Santorini?